This is the first book of its kind that describes the use of ANSYS® finite element analysis (FEA) software, and MATLAB® engineering programming software to solve acoustic problems. It covers simple text book problems, such as determining the natural frequencies of a duct, to progressively more complex problems that can only be solved using FEA software, such as acoustic absorption and fluid-structure-interaction. It also presents benchmark cases that can be used as starting points for analysis. There are practical hints too for using ANSYS software. The material describes how to solve numerous problems theoretically, and how to obtain solutions from the theory using MATLAB engineering software, as well as analyzing the same problem using ANSYS Workbench and ANSYS Mechanical APDL. 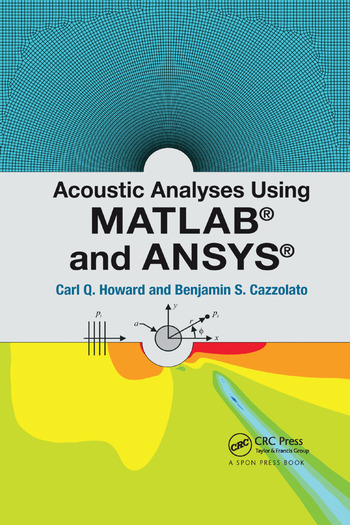 Acoustic Analyses Using MATLAB® and ANSYS® can be used as a textbook for graduate students in acoustics, vibration, and related areas in engineering; undergraduates in mechanical and electrical engineering; and as an authoritative reference for industry professionals. Dr. Carl Howard is a Lecturer at the University of Adelaide. He has been a consultant with Vipac Engineers and Scientists, Worley, and Colin Gordon and Associates, and also worked at United Technologies Research Center. Dr Ben Cazzolato is an Associate Professor at the University of Adelaide. He has over two decades' experience as an acoustic consultant and academic researcher. "… my students have found the book invaluable for learning how to use ANSYS Workbench for solving vibro-acoustics problems. The examples are numerous, detailed, well-chosen and complete with theoretical solutions. For these reasons and others, I believe ANSYS users will keep a copy of the book nearby and refer to it often." "A tour de force of quintessential theoretical acoustical topics with an exceptionally coherent crash course in finite element analysis (FEA) software." "This book is a must for those wanting to explore and investigate the world of computational engineering acoustics. …Its comprehensive instructional framework supports a conversational, down-to-earth narrative style." "These guys know their stuff!! …I thoroughly recommend this book to anyone who is involved in acoustic modelling – it forms the perfect basis for acoustic course work as well as being useful for research and industrial modelling of acoustic devices."